Diathermy is a therapeutic treatment . A high-frequency electric current is delivered to generate deep heat in body tissues. The heat can be used to increase blood flow or relieve pain. Diathermy uses an electric current to produce heat deep inside a targeted tissue. It can reach areas as deep as two inches from the skin’s surface. Diathermy deep heat therapy promotes blood flow. It also can help improve flexibility in stiff joints and connective tissue. With decreased pain and inflammation, patients can increase their range of motion. 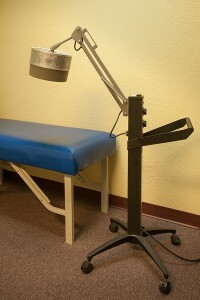 This may allow them to move more easily and participate in rehabilitation more comfortably. Diathermy is used to produce heat in deep tissues in many parts of the body. In cases of injury or pain, the intense heat may provide pain relief and better flexibility. It can reduce inflammation, increase circulation, and accelerate healing.